With each passing day, the golden-winged warbler’s native habitat is disappearing. As a result, it is currently being reviewed for addition to the endangered species list. 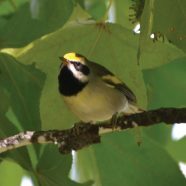 But in 2014, Wildlands Conservancy commenced habitat restoration efforts to reverse this for the golden-winged warbler, a neotropical migratory songbird, and other species, at our 1,300+-acre Thomas Darling Preserve. Gifts to our Annual Fund support conservation projects like this. Educators from the Monroe County Conservation District, together with East Stroudsburg and Shippensburg universities, will begin gathering baseline data this spring and summer to catalogue the diversity of birds currently found on the preserve. Future monitoring will hopefully show an increase in the diversity and number of birds that call our Thomas Darling Preserve home. This project is funded in part by Working Lands for Wildlife (WLFW), a partnership between the Natural Resources Conservation Services and the U.S. Fish and Wildlife Service.